Father’s Day Hype! We thank our father for beginning our long strange road of geekery. We discuss E3 and the games we are excited to play in the coming months. “Jurassic World” is seen by all. It’s the most popular movie in the world and pure popcorn summer movie goodness. Hashtag Raptor Squad! Bryce Dallas Howard gets the Not Ugly award this episode. Christopher is excited for a new show on SyFy called “Dark Matter”. It stars Canadian actors you may have seen on other SyFy and CW shows. Read: All make the commitment to read “Rat Queens” vol. 1 and 2 by the next show. Andrew continues his months long slog through “Dune”. He doesn’t love it but he knows how important it is to finish this book. Christopher continues with “The Expanse” series by James S.A. Covey. Andrew and Christopher play “Destiny” expansion PvE arena Prison of Elders. Andrew gets the guts to play with randoms via matchmaking. He also has taken to watching Twitch and has subscribed to “Destiny” streamer Professor Broman. Patrick is the busiest geek in the world with school and an internship but plays mobile game “Fallout Shelter”. It satiates his resource management gamer geek appetite. Christopher plays “The Witcher 3”. The game is deep and rich and he wishes he could play all the time. But you know, life. Second Weekend of Release Movie box office themed. The Boys come close. 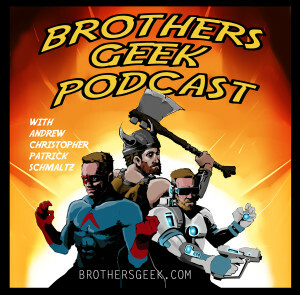 This entry was posted in Podcasts and tagged Dark Matter, Destiny, E3, Game of Thrones, House of Wolves on June 24, 2015 by BrothersGeekadmin.